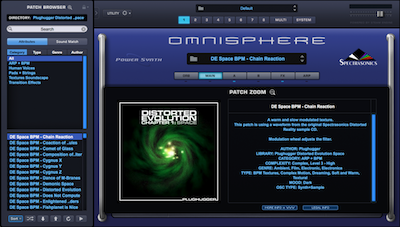 Distorted Evolution 1: Space from Plughugger, is a new cinematic sound expander for Spectrasonics Omnisphere 2 that draws inspiration from science fiction movies from the past to the modern age: mysterious soundscapes, strange machines, paranoid choirs and otherworldly textures drenched in long reverb and delays. 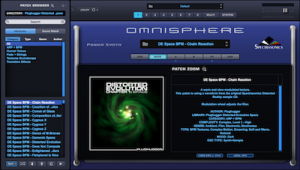 Distorted Evolution is a new series of cinematic sound expanders for Omnisphere 2. Plughugger's primary design goal was to draw inspiration from some of the early works of Spectrasonics. Back in the day when sound libraries came on CD-ROMs for big clunky hardware samplers, Spectrasonics became a big name in the movie and TV-scoring world thanks to their Distorted Reality sound libraries. Distorted Evolution is based on the sounds from three of the most significant sound libraries Spectrasonics did in that time: Distorted Reality, Distorted Reality 2 and Bizarre Guitar. No other sounds have been used to create the sounds in the library, except for a handful of vocal recordings inspired by cheesy, low-budget science fiction movies from the 1950s to the 1970s. Together with the single sounds Plughugger also created 50 multi sounds where they have stacked multiple layers to create complex soundscapes, and possible song-starters. Price: 9.90 Euro / 50% off. Until the 18th of November you can buy Distorted Evolution 1: Space for 9.90 Euro. Use coupon code DEEPSPACE to get the discount. Ordinary price is 19.90 Euro.